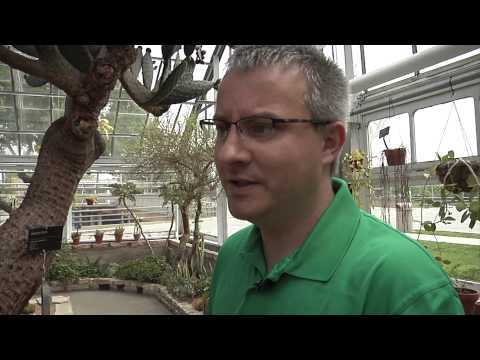 On a recent and meandering self-guided walking tour of my neighborhood's front yard and parkway gardens, I found myself buzzing by the Oak Park Conservatory to chat up its new manager, Dr. Scott Stewart. Through the local grapevine, I have learned how this deep-rooted plant guy is an expert in environmental horticulture, and was formerly a college-level administrator and educator. Scott also has a keen interest in growing plants that are native to the Midwest, which certainly floats my boat. And get this: earlier in his career, Scott was an associate editor for the North American Native Orchid Journal…so don't shy away from dropping in to the Conservatory to pick his brain about that, or about any plant that grows inside and out of his glass houses, including the wild ones I alluded to earlier -- the native to Illinois varieties, and other plants, that can help to naturally increase the biodiversity in your yard and neighborhood, while protecting your garden (without using pesticides) from unwanted pests by attracting beneficial insects to your landscape. What I also learned that day from Scott is that they are in the planning stages of installing a new 3,500 square foot "discovery" garden on the east side of the building. By 2015, it will feature miniature versions of Illinois' wet, dry and wooded ecosystems. Happily, this new public demonstration garden will be dedicated to the late, great and tireless Oak Park volunteer, Elsie Jacobsen. It is certainly a fitting and memorable homage to her, and marker for the 85 years of surprising plants, fun stuff for kids and education for all that this Park District of Oak Park's public gem is.